Editor’s note: We’re huge fans of Asana, here at Team Freedom. We use it to manage all our product and content related tasks, and it works like a charm. So when Paul Minors, Productivity Blogger & Consultant, offered to write this post about using Asana to achieve your 2017 goals (personal or professional), we were thrilled. If you’ve been looking for a way to systemize your goal setting and achievement, this is just what the doctor prescribed. It’s that time of year again where everyone is thinking about their goals and aspirations for the year. 2017 is upon us; the slate has been wiped clean, and you’ve already planned what to focus on this year. Planning your goals are great. Natalie recently talked about the importance of planning your goals and how to set your business goals for 2017. However, linking your big picture goals for the year to daily and weekly tasks isn’t always straightforward. But it’s important to bridge this gap, so your daily activities contribute to your ideal vision for the year. Fortunately, I’ve found a way of making this a little easier using Asana, a highly versatile project management software. By setting up your goals in Asana, you can outline your big picture goals and break it down into daily tasks, all in one place. If you are not familiar with Asana, this is an excellent excuse to get started. You can begin by reading the ultimate guide on how to use Asana. Believe me, it will make planning and tracking your goals much easier. Before we jump into how to set up your goals in Asana, let’s have a look at the hierarchy of your goals. In fact, I suggest you create this hierarchy on paper (physical or digital, your choice) before setting them up in Asana. What does your ideal year look like? Do you want to launch your very first business? Do you want to quit your job and start working for yourself? Or do you want to grow your existing business and serve more people? The answers to these questions will help you to define your vision for the year. Your vision is the destination and the top-level outcomes you’re pursuing. Think about WHY you do what you do and align your goals with your vision. Which is that one project/goal/outcome you can’t stop thinking about? What do you want your personal and professional life to look like in 2017? What are your non-negotiables? i.e. what are some things you have to do next year? For, e.g., holidays, travel overseas to see family, etc. A season is like a theme that categorizes what you’re going to focus on for a shorter period. So, instead of having a long list of random tasks to complete, you group them into seasons and focus on one season at a time. For example, my first season for 2017 (from January to the end of March) is “Book Club.” During this time, I’ll be focusing on launching and growing my book club. The monthly goals and tasks I work on will predominantly be focused on this season or theme. At this point, I want to emphasize that even though a season defines your focus, it doesn’t mean you can’t work on other unrelated tasks. During my “Book Club” season, I’ll work on other tasks as well (e.g. accounting, admin or writing blog posts), but I still use the seasons to define my primary focus for the quarter. Monthly goals are the short sprints and targets you’re going to focus on, which contribute towards your season’s goals. As you can see, these monthly targets, when completed, contribute to the completion of your season’s goals. These weekly and daily tasks should also help fulfill the monthly goals and in turn, the quarterly season goals. By this stage, hopefully, you can see how deconstructing your goals helps to create a clear link between your big picture goals/vision and the daily and weekly tasks you need to work on. Now let’s set this all up in Asana. You’ll need to log into your Asana account (don’t worry, you can sign up for free). Include a task at the top of the project, which lists your annual goals and vision for the year. Use sections (simply add a : to the end of your task) to list your four quarterly seasons. To make these stand out from the monthly goals, I write these in CAPITALS. Use sections to list your monthly goals. Be as specific as you can and include sales, traffic and subscriber target that you’d like to reach. Add tasks from other Asana projects by adding them to the new goals project. You can do this by clicking the + icon next to the project name in the task page. As you can see in the video, I have various projects in my Asana account, where I plan what to do. Then I have a master project called “2017 Goals,” where I can pull in various tasks from other projects by adding existing tasks. I then use sections to create the seasons and monthly goals, where I group specific tasks together. Earlier, I used to scan my Asana projects every few weeks and assign due dates to tasks based on what I felt was most important. If I had a new idea or if something urgent came up, I would slot this into a project and set a due date in the near future. This approach was okay… But the issue was I didn’t have a centralized place where I could see what I have coming up over the next few weeks and months. In Asana, you have the “My Tasks” section, but this only shows you the next 7 days (everything further out gets hidden in the “Later” section). Instead, by working in “seasons,” you can create a clearer picture of how you’re going to spend your time. Simply getting everything into the one place will make you feel way more organized and makes it very clear what you’ll be focusing on for the next few weeks and months. Grouping tasks into “seasons” also gives you a greater sense of purpose and focus for that month. So, instead of working on a random jumble of tasks (even though they’re important), it’s better to work in “seasons” where you have a clear priority for that quarter. Download and set up your free goal planning Asana template. List your annual goals and vision for the year as a separate task at the top of the project. Write your four quarterly seasons. Think about the big projects coming up that you’d like to work on. For, e.g., product launches, etc. What are the common themes that you can use to group specific tasks together? List 3 monthly targets for each season. Try and reverse engineer your goals so you’re guaranteed to succeed. For, e.g., generating $1,000 of sales is guaranteed when you sell 10 items @ $100. Make the numbers work! Finally, list the tasks you need to complete to hit your monthly targets. You can break these up further by using subtasks. You can also go through other Asana projects and add existing tasks to the goals project. Don’t worry about filling out everything in one go. Just try and plan a couple of seasons to start with. As you spend time thinking about your plan, the path forward will become clearer. Working in seasons doesn’t mean you can’t do unrelated tasks at the same time. 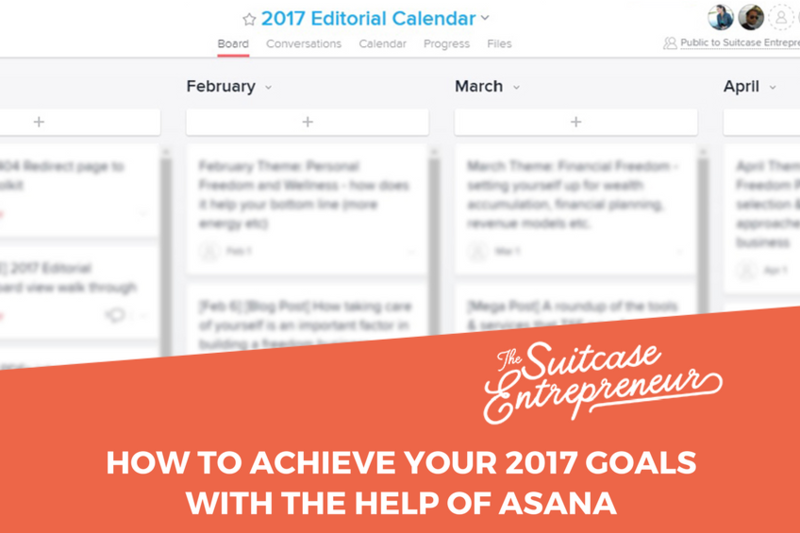 Hopefully, I’ve convinced you of Asana’s incredible power in helping you achieve your 2017 goals. Now, put this all into action and make 2017 the year where you make your vision a reality. About our Guest Contributor: Paul Minors is a productivity blogger, consultant and Asana expert at PaulMinors.com. 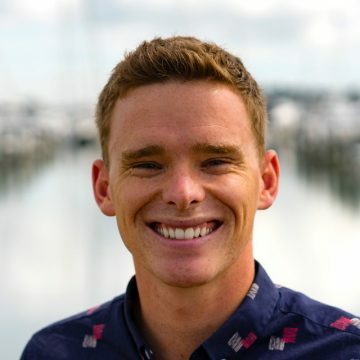 If you want to empower your team to do their best work and grow sales, then book a free 30-minute call with Paul or ask him about getting an Asana account review and see how you can have your most productive year in 2017.